Poo Poo Point via Chirico Trail (upper left), Margaret’s Way (upper right), Coal Creek Falls (lower left), Grand Prospect (lower right). After two weeks off from hitting the trails, I needed all the fresh air I could get before the holidays truly arrived. 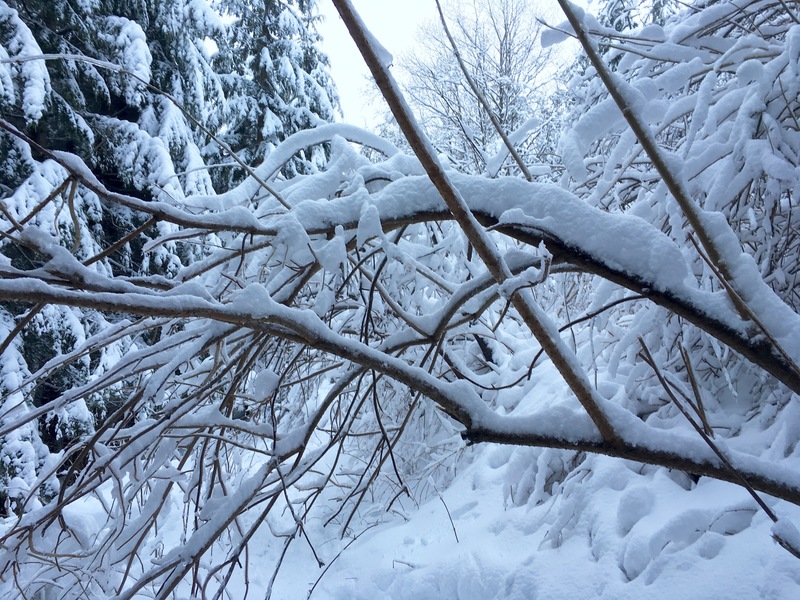 I wanted to enjoy my hikes this week, but the severe weather and mounds of unpacked snow throughout the Cascades provided too great a risk of a treacherous commute for the reward of alpine views. 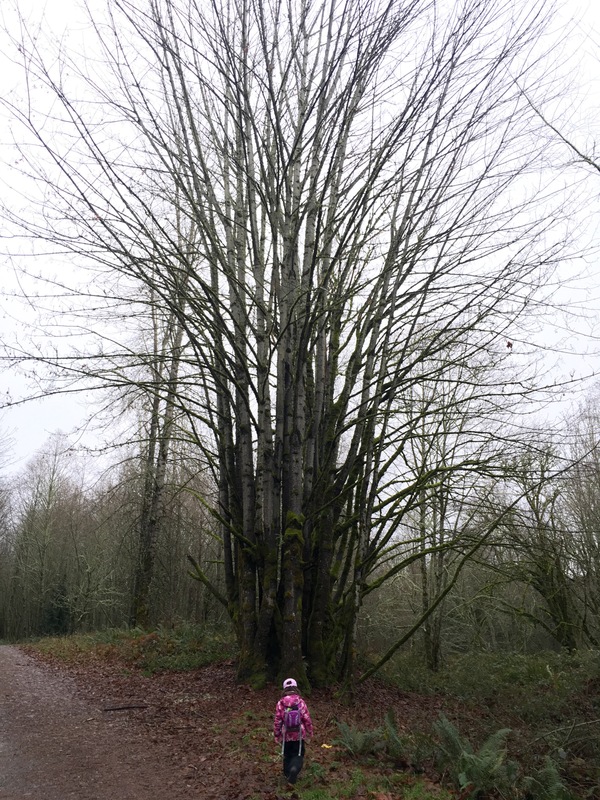 With so many trails from which to choose just 15 minutes from my home, the venerable Issaquah Alps offered me the restorative calm, wondrous exploration and unexpected excitement! 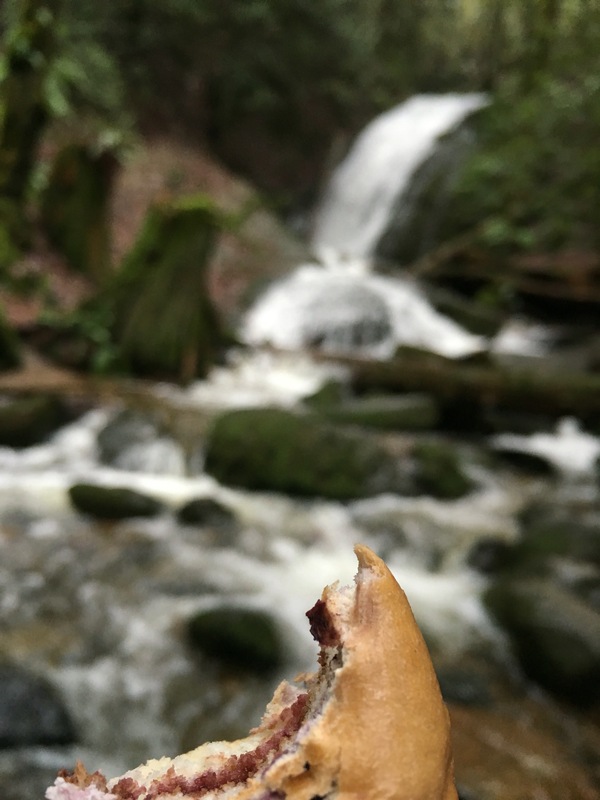 I grasped at the opportunity to hike four mountains in four days, each providing me unique experiences and incredible memories. I survived five ballet performances, 150 dancers, 800 stems of roses and one chocolate birthday cake over two long weekends. With that accomplishment behind me, I deserved a big reward in the mountains. Poo Poo Point called my name first thing Monday and I followed the echoes up Chirico Trail. Following torrential rains all weekend, I was surprised to see as many cars as I did in the lot this morning. The two-mile trail up was one I have done many times, making it the perfect hike to free myself from the chaos of ribbons and tulle tethered to me over the past few weeks while reconditioning my legs and lungs with the freedom of the mountains. Truth be told, I’ve often avoided Chirico Trail because of its popularity. Now that winter is here, it’s become my go-to hike when in need of something mildly strenuous in a short amount of time. With less folks willing to hit the trail under inclement PNW winter conditions, I have been able to appreciate the solitude and beauty around me. The rocky steps along the ridge provide challenging opportunities to lengthen my stride up relatively modest inclines, while simultaneously offering peek-a-boo views through bald branches. One of my family’s favorite farms, Fox Hollow Farm, is now clearly discernible in the valley below while Squak Mountain looms closely above during this initial section of the trail. 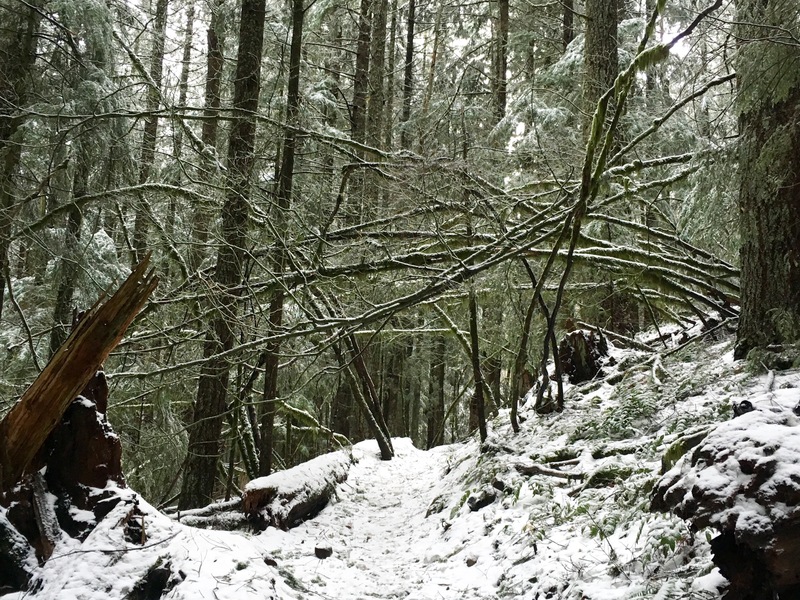 After a few switchbacks along the ridge, Chirico Trail winds deeper into Tiger Mountain. The end of the first mile is marked by an over-sized log bench at a natural turning point. 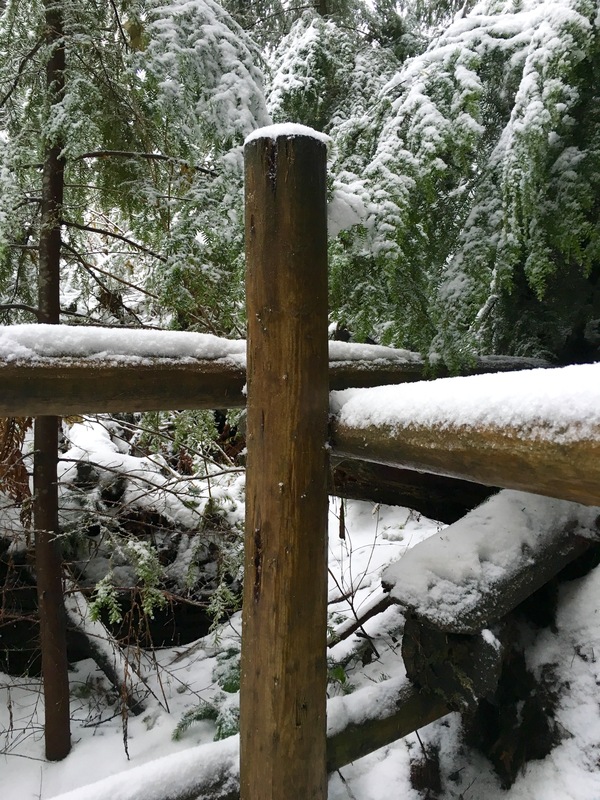 Perhaps intentionally placed by the fantastic trail builders, the large seat allows resting hikers to peer directly up the path heading into the wooded forest. From there, the trail becomes a root-covered route under tall evergreens protecting hikers like me from the full effects of rain and wind. 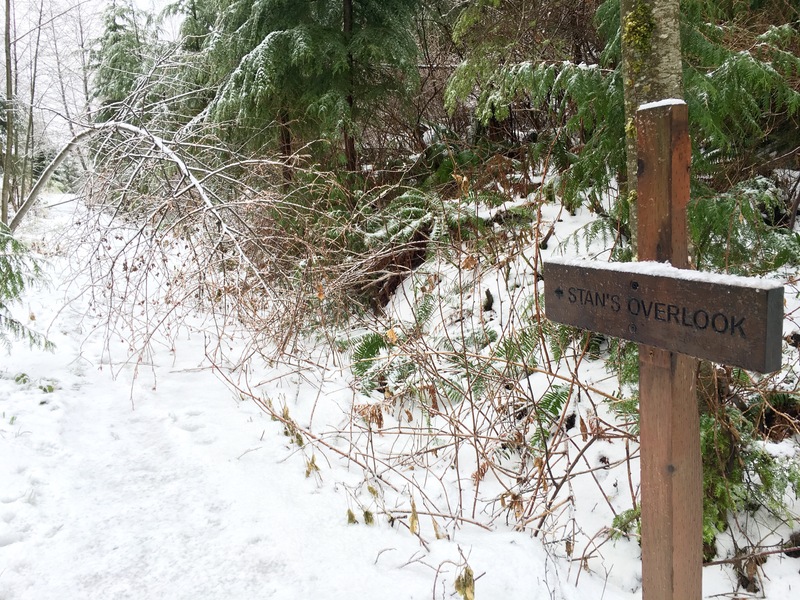 Within three-quarters of a mile from the bench, one is faced with a wooden gate reminding hikers to stay on trail after first luring them in with a remarkable peek of the Cascades spreading out over the horizon. Upon reaching this point, I am often overcome with a sense of excitement knowing I’m about to summit my hike for the morning. Following a short incline deeper into the forest, the trail leads one out to the grassy clearing known as Poo Poo Point. This southern knoll is a popular stop for most hikers, as it offers tremendous views even on a miserably wet and windy day. On a magnificent blue bird day – which was not to be today – Mount Rainier rises up in the southern distance while the Olympics border the horizon to the north west. Since I had made it up the trail in good time, I decided to head over to the northern launch spot this morning. Rather than taking my bike out for my weekly ride today, I decided to take my two feet up a trail I hadn’t yet finished. After dropping both hiking buddies off at schools on opposite sides of Cougar Mountain, I found myself driving back down Route 900 through the Cougar-Squak Mountain Corrider only to return to Margaret’s Way on this rainy morning. I was last here with Little Hiking Buddy back in early October, where we spent the better part of our adventure counting the endless mushrooms that dotted the trail, which left us short of our destination goal. Today, I planned to make it to Debbie’s View…planned…planned. Well, at least I had a goal. I realized the secret was out for this new trail when I pulled into the lot and saw at least eight cars parked throughout the area. My heart sank just a little at the thought of being surrounded by so many hikers on a relatively easy trail. Never mind the momentary disappointment, I was still going to enjoy this hike. I quickly jumped into the trunk of our family car and loaded up my gear in the warmth of my dry surroundings. 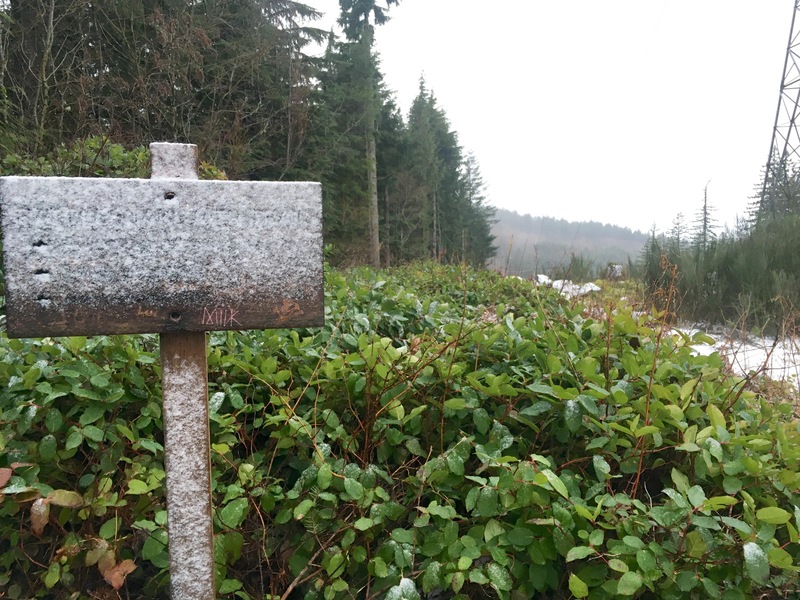 Once I was ready, I headed out beyond the maintenance office building up the road and past the old Issaquah Highlands Recreational Club to the start of Margaret’s Way. This trail was a delightful experience the first time with Little Hiking Buddy. Wonderfully maintained, Margaret’s Way initially ascends up a narrow little path before reaching old mountain roads previously used for camping and logging. After a short half-mile stretch on this wide road, a little viewpoint is offered to give one a taste of what’s in store from above. Unfortunately, just like last time, there was no view to be had beyond the heavy downpour. It didn’t matter to me either way since I chose this trail particularly for its protective forest cover. From the road, the trail turns into a true hiker’s path along the forested hillside. The scenery laid out ahead transported me to a realm of wonderment. There were countless runoffs flowing down the mountain into Tibbett’s Creek as well as moss-covered trees brightly featured against the dull mud on this seemingly gloomy day. Aside from a few slick points on the trail, my hike up to the near summit was relaxing with just enough distance and elevation to get my heart going. I truly loved all this trail offered today: moderately inclined pathways with a few undulations, distinctively portioned segments with switchbacks and creek crossings, and interestingly lined routes with fern and hemlock as well as with tall fir and cedar trees. I felt happy in my secluded bubble this morning. At one point, I finally ran into a large troop of older gentlemen heading back down the trail. I surprised them, with a few commenting I was mildly crazy for hiking alone on this wet morning. 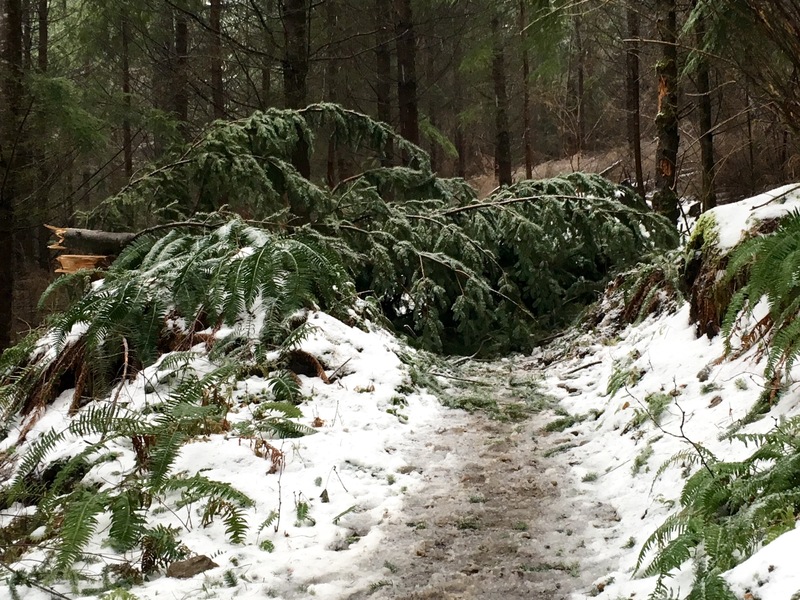 The continuous influx of winter storms these past few weeks littered the trail with numerous fallen trees. While some were broken at the trunk, many had been pulled out by the roots along the trail itself. Sadly, it made me wonder whether this newly carved path was potentially hurting the forest or if nature was merely renewing itself. 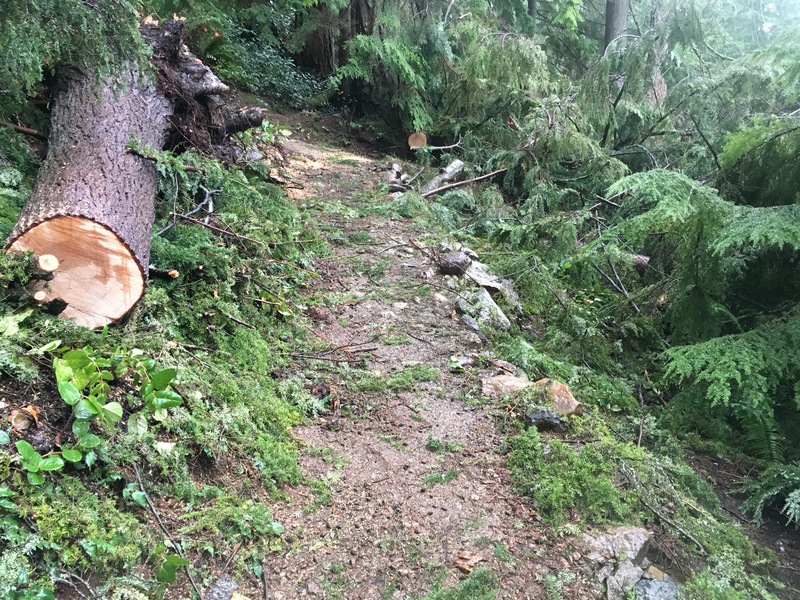 Whatever the answer, the maintenance crew had already gone to work in restoring this trail. 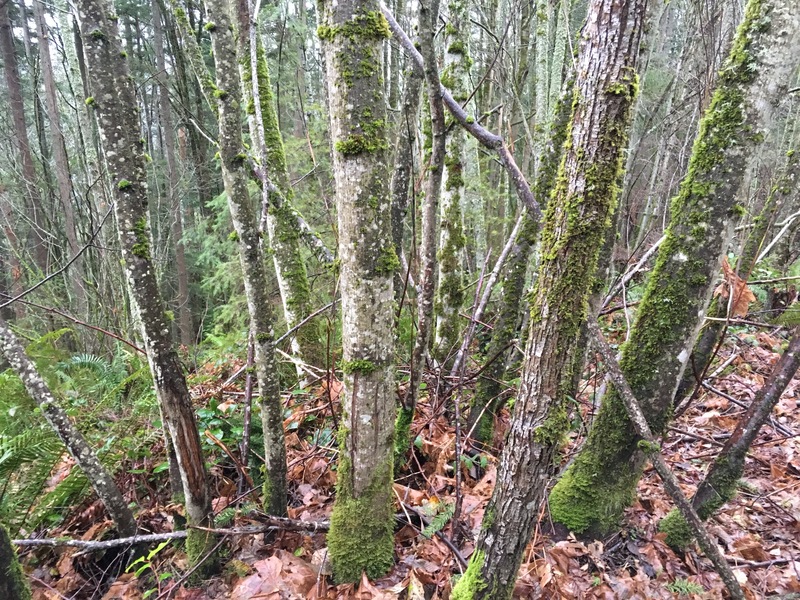 Throughout the upper portions of Margaret’s Way, one could find fresh sawdust from recently cleared out trees previously blocking the trail. Thank you to the amazing maintenance crews for all your hard work! I continued past countless branches and storm debris until I reached a rocky corner of the trail about 2.5 miles from the start. This was where LHB and I decided to turn around after enjoying our fine lunch of Nutella sandwiches. After another mile or so past my previous end point with LHB, I made it up to the flattened junction of Chybinski Trail, Perimeter Loop and West Peak Trail. It occurred to me at these signposts that I was also a mile short of Central Peak, just as I was during my eastern trek up Squak Mountain last month. Oh well, just another goal to set for 2016. Knowing I was almost at my absolute time limit this morning, I jogged towards Debbie’s View and then realized it just wasn’t worth being stressed out on my way down. Given the heavy rain, there would be no view of Mount Rainier waiting for me – so I turned around and wound my way down the mountainside. At least I enjoyed every SECOND of my hike in the rain this day. Better yet, I was greeted with my favorite questions from LHB upon meeting her at school: “How was your hike? Where did you go? How far did you go? What did you see?” I couldn’t wait for our adventure together tomorrow! My final view before turning around on my way to Debbie’s View. Another Adventure Friday with my Little Hiking Buddy!!! With more winter storm warnings abound throughout Snoqualmie and Stevens Passes, we stuck close to home yet again today. 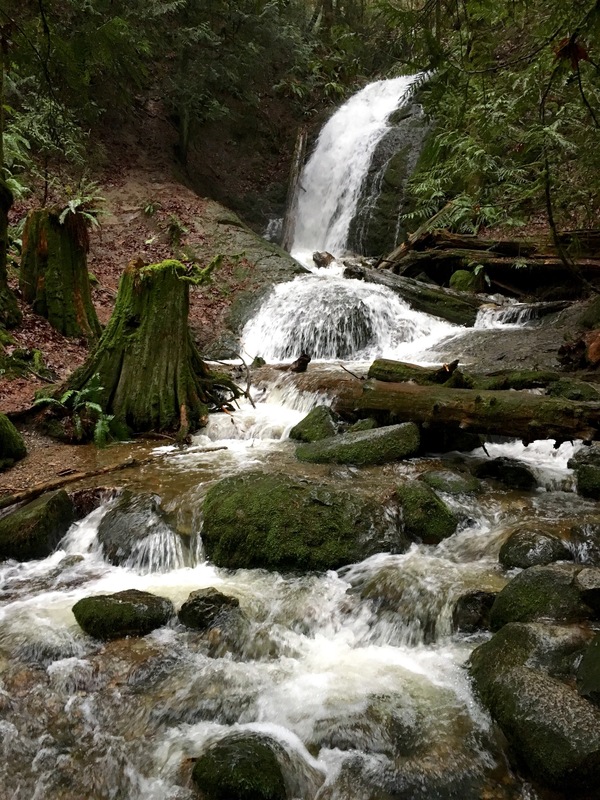 LHB needed the motivation this damp morning, so a waterfall hike to Coal Creek Falls on Cougar Mountain was the perfect answer. 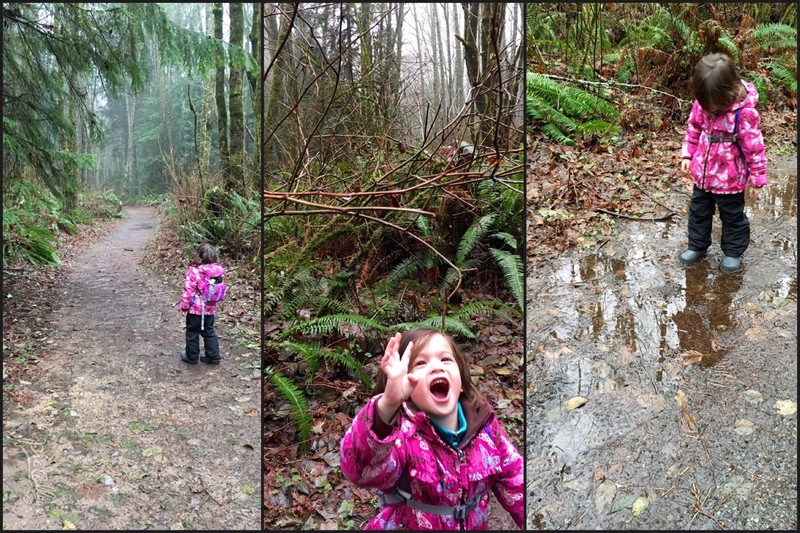 Following Big Hiking Buddy’s drop off at school, we headed west to the Red Town Trailhead. This popular trail was already filled with neighborhood hikers and trailrunners finishing up their morning excursion in this urban wilderness when we arrived at the parking lot. Within a tenth of a mile from our start, we turned left unto Cave Hole Trail. The path here started with bare deciduous trees that loomed overhead, whose finger-like branches beckoned us forward into the forest. 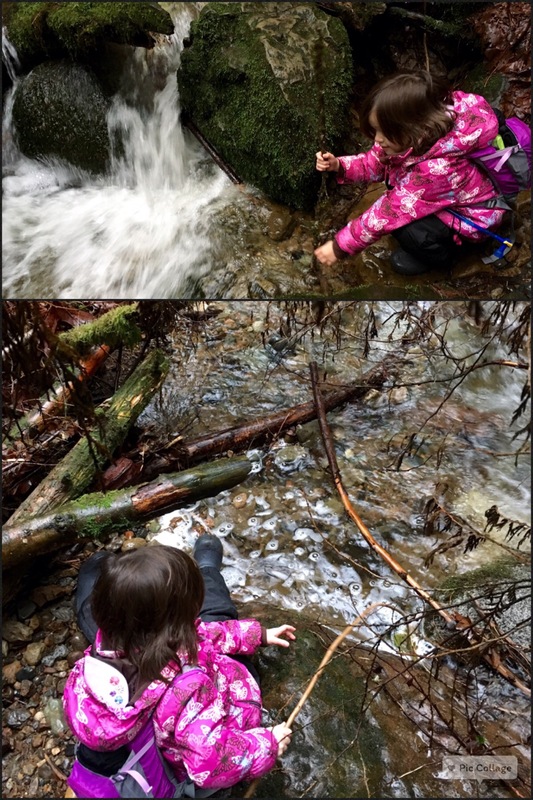 LHB immediately found a few points of interest, including countless puddles in which to enjoy more than enough delightful stomps in her waterproof boots. 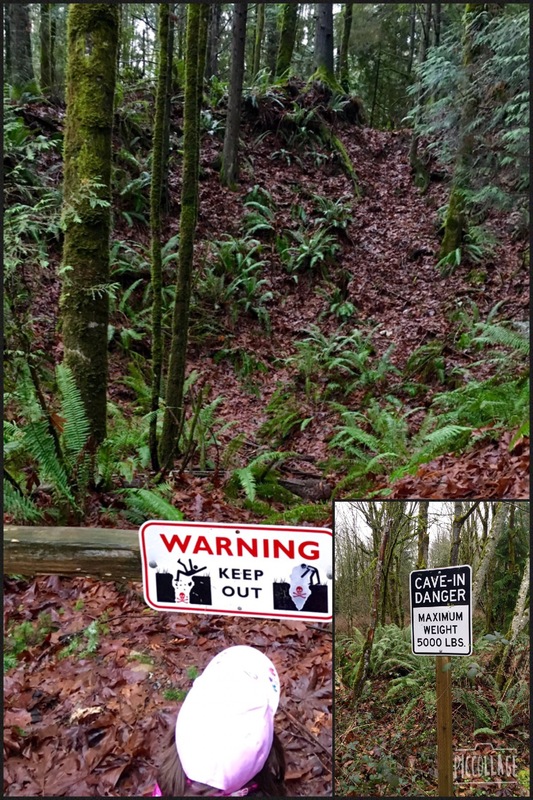 True to its name, we encountered several cave holes on this trail, all clearly delineated with signs preventing us from exploring haphazardly. LHB wanted to know who found these caves, what they were for and why they were so dangerous. I loved that her curiosity was once again piqued about the history all around us. This wonderful trail led us up a mild incline through trees and against a current of runoffs flowing down towards Coal Creek itself. 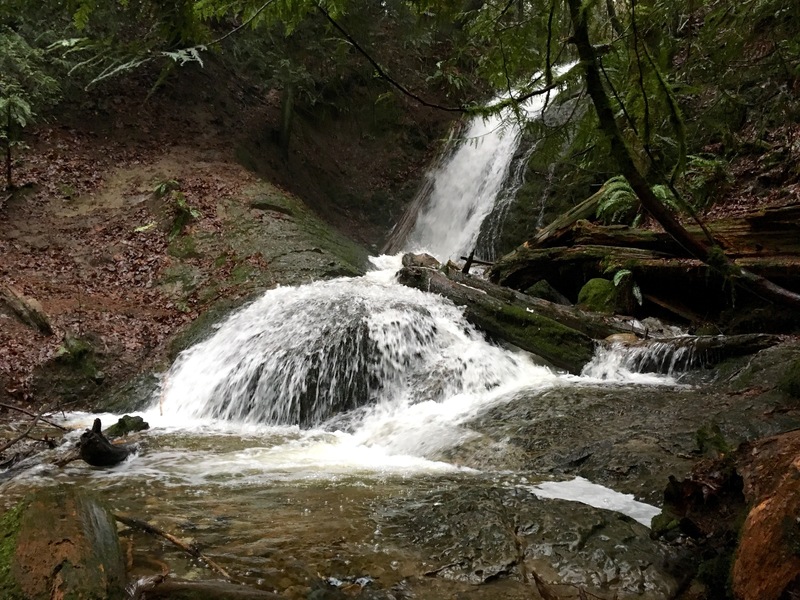 After walking through a forest of ferns and conifers for three-quarters of a mile, we reached our primary trail to Coal Creek Falls. Though it was another quarter of a mile or so to the Falls, we could hear the water flowing through the Creek at a stronger pace the further in we went. As we hiked higher above Coal Creek, we were offered clearer views of the water below. LHB was quickly becoming more excited with each step, until she shrieked at the first sign of the Falls. Before even arriving to our final destination, I noted a large fallen tree across the creek bed just before the wooden viewing bridge. The trail here was incredibly muddy, primarily due to the flooding from the recent winter storms that heavily damaged the Pacific Northwest. Although today was rainy, Coal Creek was flowing at a manageable rate for us to safely approach the Falls. LHB was overjoyed at the thought of playing near the frigid waters. She scrambled past tree roots and over logjams to get as close as she safely could to the splash pool. LHB wanted to stir her “hiking soup” for us to enjoy over lunch. After a few moments in a tight little corner of the pool, I convinced her to walk back downstream for a more comfortable seat for our picnic. Instead, she decided to perch herself on a wet rock along the shore to catch us some imaginary fish to go with our Nutella-filled bagels. Her imagination was fluidly-filled (every pun intended!) with inventive ways to build her new home in the sand with which she would share with the forest creatures. I enjoyed watching her face light up as she described every detail of her story. For me, this moment was the pinnacle of our adventure today. Following our delightful lunch filled with real and imaginary treats, I steered us across the bridge and up to the Quarry Trail, which would loop us back to our start. This section of the hike led us down towards the forest floor through a few switchbacks on a very well-maintained trail. Once we reached Coal Creek, we crossed over the water to explore the Meadow Restoration in progress on the far side of the Creek. 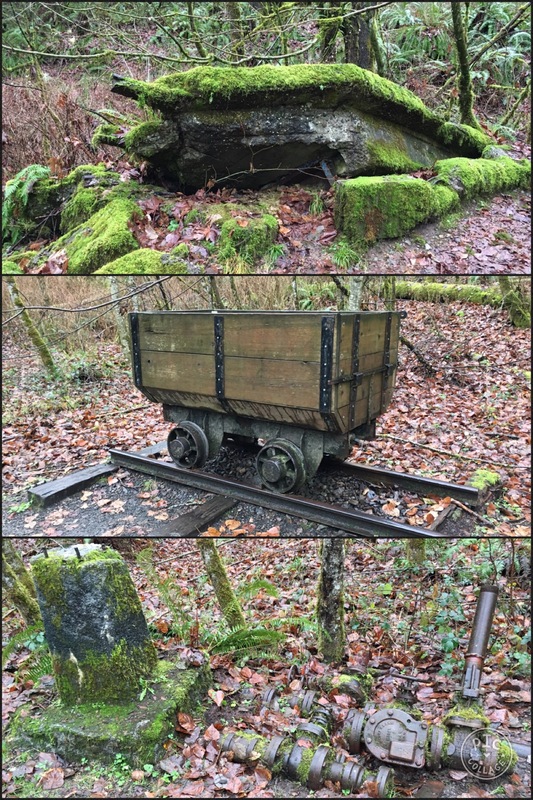 At the end of Quarry Trail, we closed our loop with a return to Red Town Trail by exploring the other end we hadn’t yet been on. 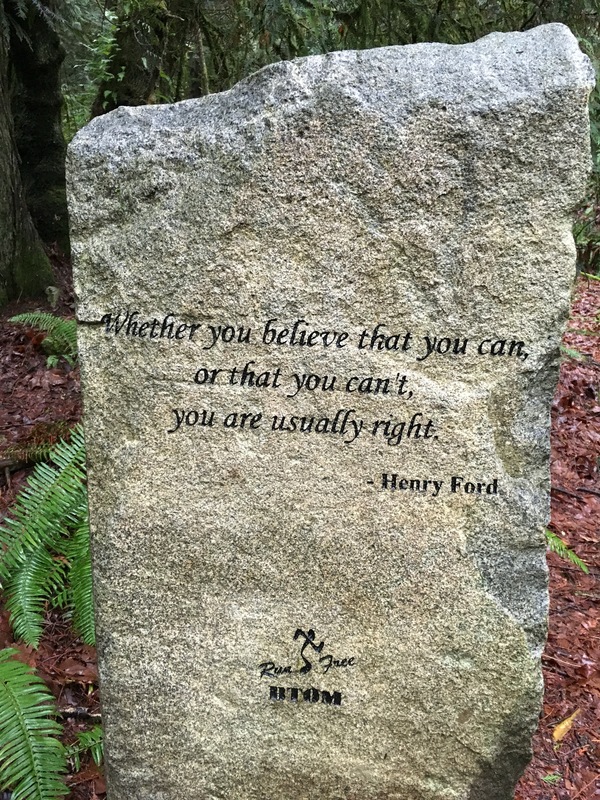 This section included more mining artifacts, cave holes, and horse troughs as well as a stone monument commemorating one of my favorite quotes that I often share with my girls. It was as if I was meant to be on this trail with LHB today. When we got home, LHB quickly drew a picture of the falls she saw with a caption of where she had been and what she had done. After a few weeks off from hiking, I’m so glad we were able to return to our Adventure Fridays and am looking forward to more time with both my hiking buddies out on the trail. 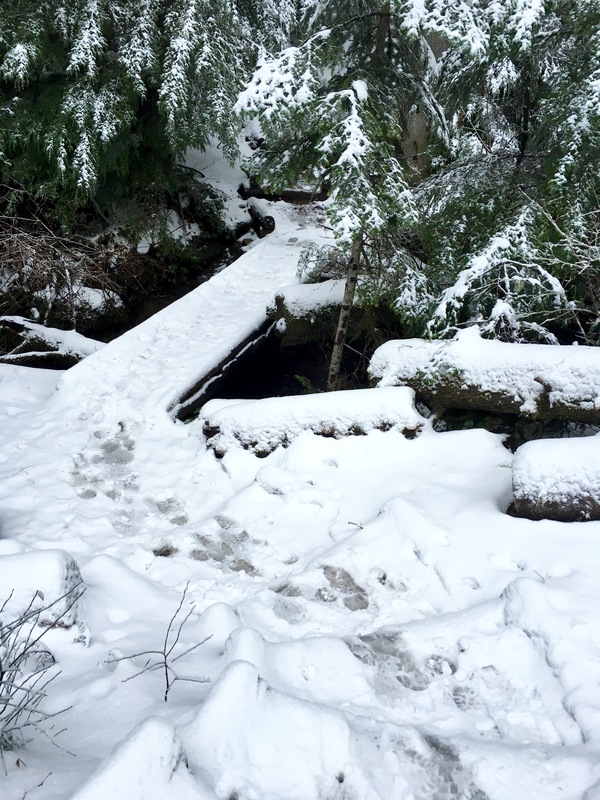 Today was my last chance for a snowy solo hike before my hiking buddies would be home for the next two weeks over Winter Break. Unfortunately, the weather was not very agreeable again, as Snoqualmie Pass was hindered with possible closures from avalanche warnings. Going with my recent theme of trails within Issaquah Alps, I decided to head up Rattlesnake Mountain to Grand Prospect for hike free from avalanche dangers yet with promises of winter white on this side of the Pass. Little did I know, I would be presented with other unexpected challenges on this moderate trail. While most folks associate Rattlesnake with its famous Ledge and Lake from the eastern side of the the mountain, many don’t often travel from the western rim. 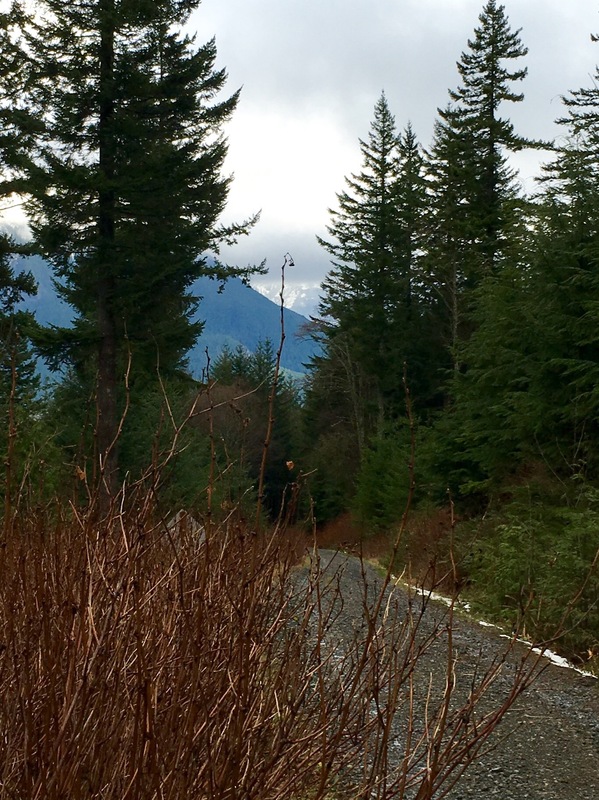 In fact, due to its proximity to North Bend and the Cascade Peaks throughout the Snoqualmie Pass region of Interstate 90, most hikers don’t realize Rattlesnake Mountain belongs as part of the Issaquah Alps. 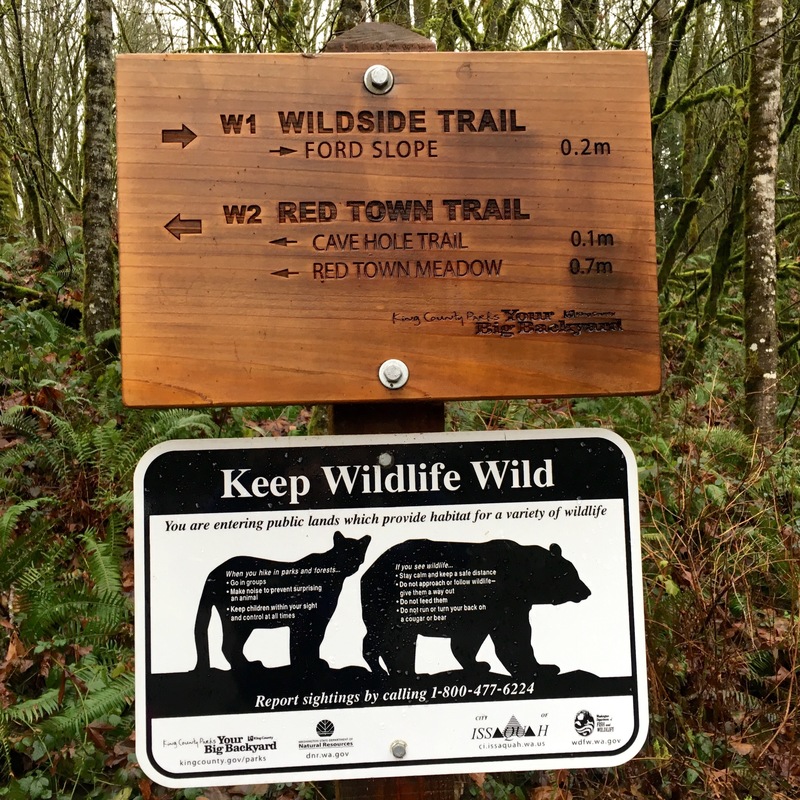 Just off exit 27 along I90, Rattlesnake Mountain Trail can be found just past Snoqualmie Point Trailhead, within the confines of eponymous park. I arrived at a parking lot just before 8 am today to find a happy trio of hikers about to head out on this dark, wet morning. They were nice enough to offer to wait for me, but I politely declined as I was in need of silence to regain my senses. It was still good to know I wasn’t alone on my hike, something which later would prove to be a valuable resource. 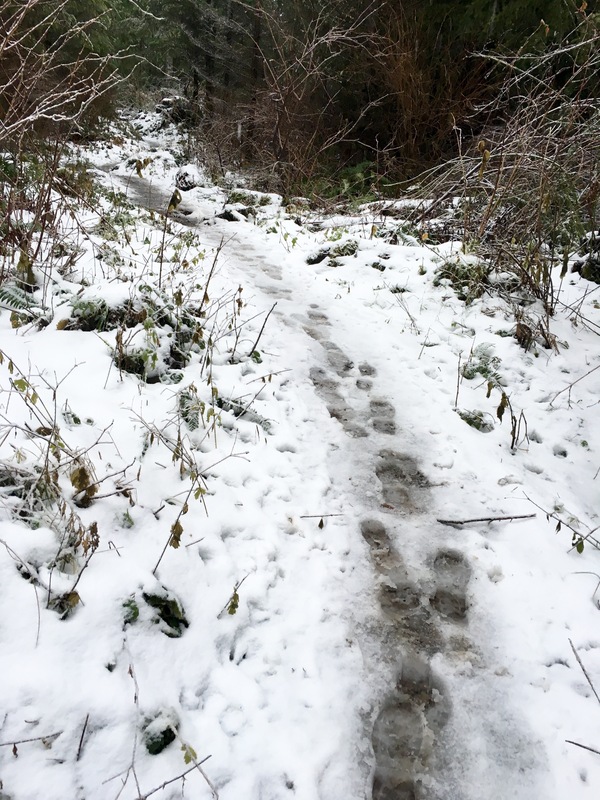 Once I covered myself head-to-toe in protective rain gear, including gaiters and microspikes, I quickly set off on the trail. I had to be in Seattle later that day for a piano recital, so I wanted to make sure I had enough time to complete my 11 mile round trip hike with the intended destination of East Peak. My microspikes seemed like overkill at the onset of my hike. Although it had been raining endlessly for the past few weeks, the trail was covered with gravel and large rocks for the initial mile rather than the anticipated pools of mud. 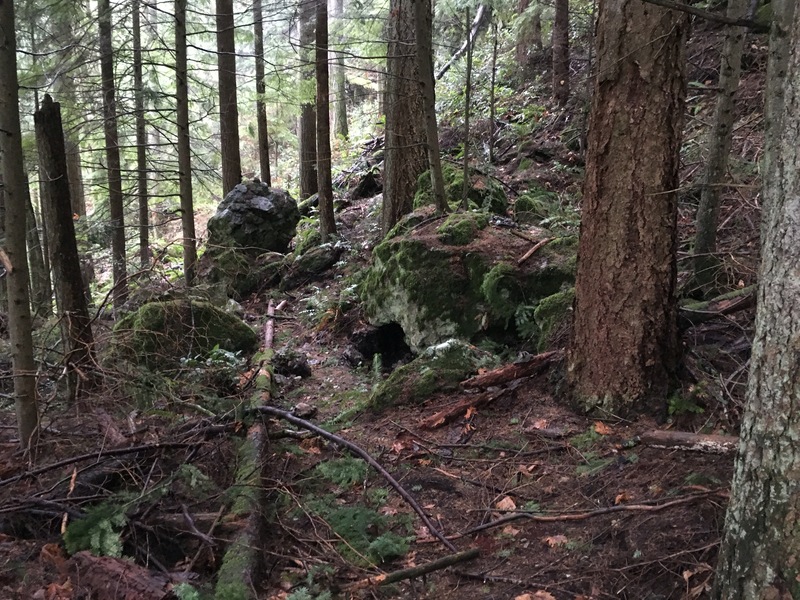 However, once I crossed the forest service road at the junction to Rattlesnake Mountain Trail, the path changed almost completely. 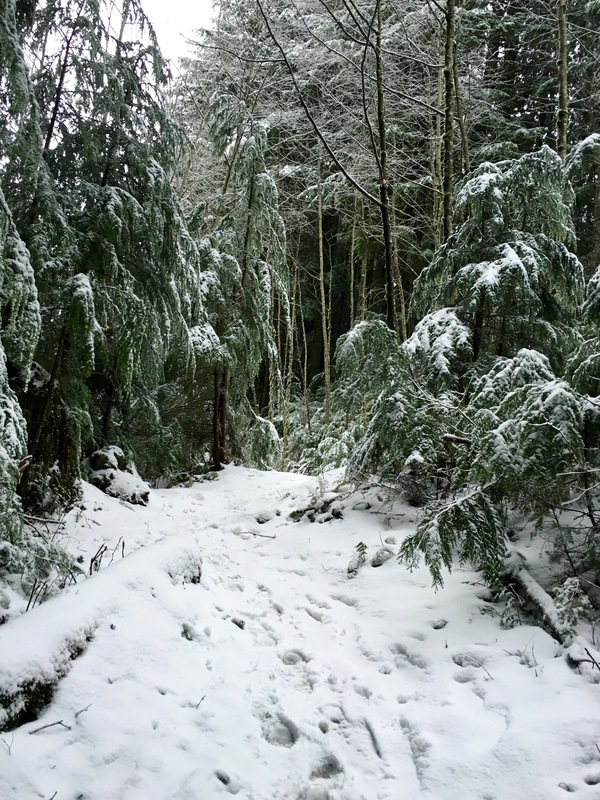 Previously covered with rock and some mud, the trail quickly went from having patches of snow and ice to being fully covered in white, along with hosting a few large conifers that had fallen and were now blocking the obvious way up the mountain. These were all justifiable reasons for wearing my traction devices underfoot. Though I have been on this trail before, I’ve only had enough time to do the 5 mile round trip to Stan’s Overlook. This morning, I bypassed the viewpoint completely, while noting no one else had been out that way today since there were no fresh prints on the trail. I found the tracks of the hikers ahead and followed them up the way through the snow. 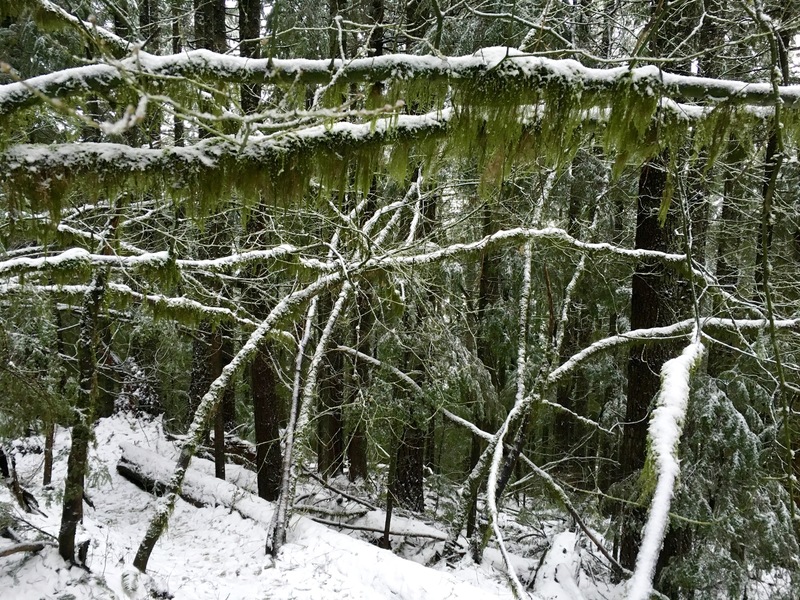 It felt completely serene at this point on the trail, with lightly falling snow just dusting the mossy evergreens and a stillness that surrounded my environs. It was almost too peaceful, leaving me with the need to keep moving. After passing beyond Stan’s Overlook, I continued deep into the forest. 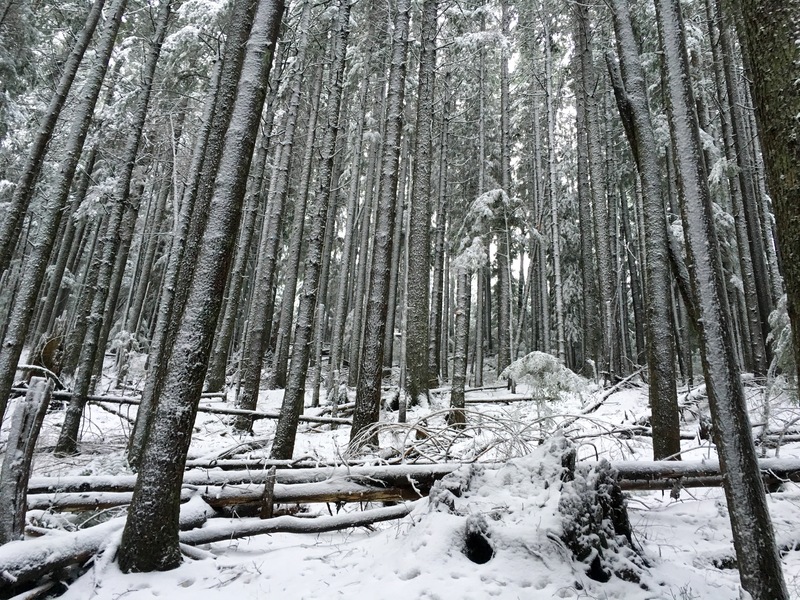 Here the scenery went from highlights of white on conifers to an all out winter wonderland. It was magical. 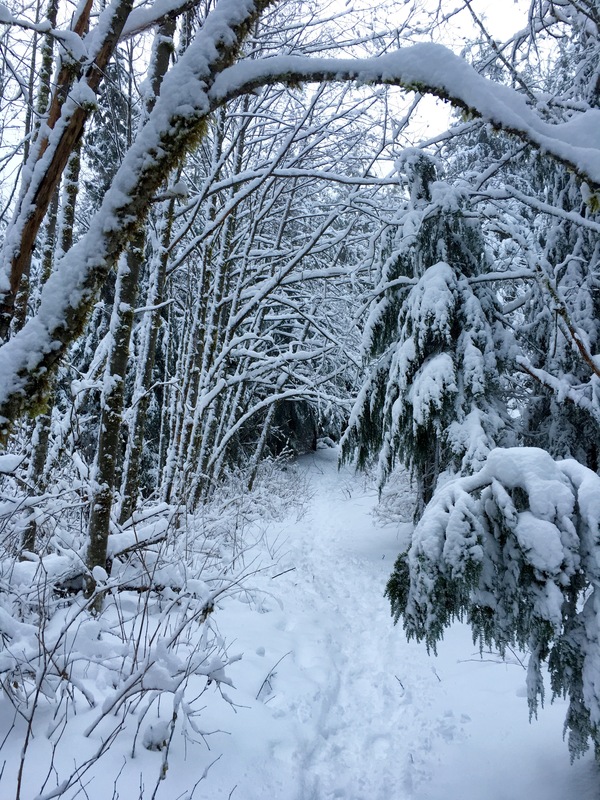 The crisp smell of fresh snow on pine, the lace-like patterns of crystals wrapping around tall trunk lines, and the trickling of water from the creek ahead felt surreal for an island girl like me. 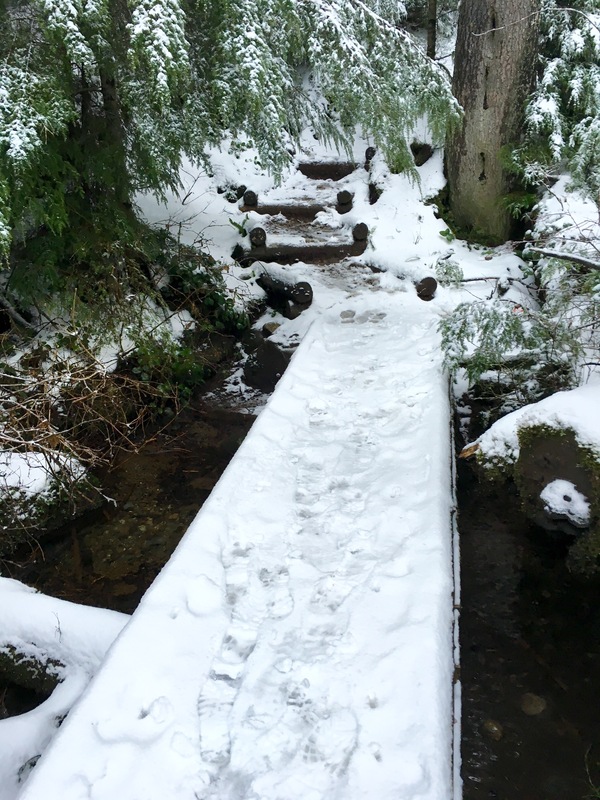 Once I got to the snow-covered stairs leading me across the bridge to the other side of the creek, I stopped to process the natural loveliness all around me. The quiet of this still moment erased all the noise and wrinkles of the past two weeks, giving me hope for sanity through to the New Year. After what seemed like almost forever, this cinnamon black bear disappeared into the woods opposite the direction of my destination. I wasn’t sure if I was more scared or thrilled at this sighting. Although I was on a solo hike, this creature seemed more curious and fearful than anything else. Don’t get me wrong, I wasn’t interested in finding him again! I just wanted to be on my way so that I would quickly meet up with the trio ahead of me. Safety in numbers! As I made my way up the trail, I tried to keep my wits about me. I stopped every few feet to look around to make sure I was relatively safe. When I came up to where I first saw him, I made note of his tracks in the snow. For the next two miles, I kept abreast of his prints along my route. This bear followed trail straight down all the way from Grand Prospect, where I finally met up with the hiking trio who were in fact waiting for me. Upon my approach, I excitedly blathered on about seeing the bear, which they had also sighted. He must have been scared down the trail towards me when they first saw him. While we four discussed our experiences, I again noticed movement down on the trail from where I had just emerged. Then in full view, the curious bear popped out onto the main path about 30-40 yards away from us. 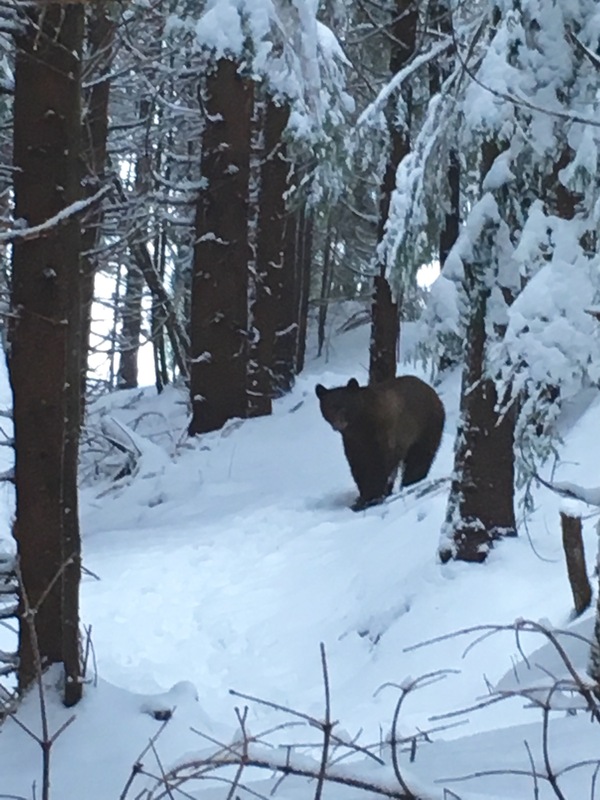 When I pointed him out to the group, the leader of the three made me aware that the bear most likely followed me for over a mile. My feeling of daring thrill instantly turned into fearful chill. 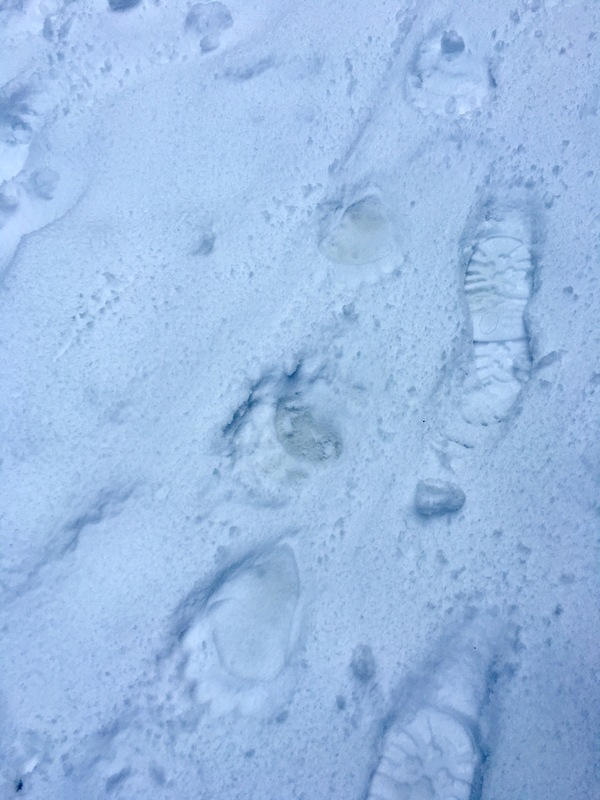 I was unknowingly tracked by a bear over a relatively long distance. At this point, the inquisitive animal not only watched us, but began gingerly approaching even nearer towards us. He was wide-eyed with curiosity. We decided it would be better if he contained his interest in us, so we amped up our volume and movement until we scared him off. Rather than heading back in the direction of the bear, and since I was the only one with bear protection, we all headed up to Grand Prospect together. I was only about 100 feet short of this viewpoint when I had run into the group. After a tromp through snow-covered brush, I was led to a white out view of what otherwise would have been Mt. Si, Mt. Teneriff and Mailbox Peak just ahead. Once we decided it was relatively safe to start our descent, we all descended together. I happily abandoned my original quest for East Peak this morning and settled for the 9 mile round trip trek. As we traveled back, we ran across many hikers just beginning their way up the mountain. 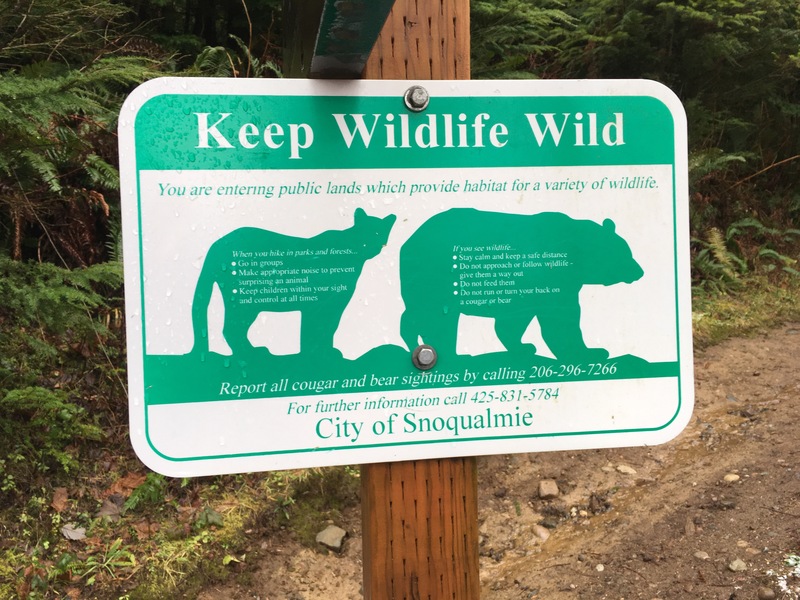 We felt it only necessary to provide them with a public service announcement of the curious cinnamon black bear, particularly those with four-legged companions. Like me until today, I don’t think many people realize black bears of the Pacific Northwest do not undergo deep hibernation like those further north, but rather enjoy fitful periods of rest up to 6 weeks at a time throughout the season to briefly awaken for unknown reasons. This interesting group of avid hikers was just a subgroup of a larger troop who regularly journey together throughout the Cascades. What a pleasure it was to join them on the way back. I enjoyed great conversation and anecdotes, learned about additional trails along the I90 corridor, and looked forward to meeting them all again on future expeditions. In fact, I was invited to join their mailing list for weekly hikes throughout the year. I’m so thankful we all made it back safely. We were even given a quick view of the snowy peaks to the east once we made it lower ground. Today was a day I would never forget for so many wonderful reasons.